As an aside I would observe at this particular moment that much of the Gulf of Mexico, to the extent it can enjoy God and be holy must be weeping, if possible, because of human destruction and sin. "Woman, believe me, the hour is coming when you will worship the Father neither on this mountain nor in Jerusalem. You worship what you do not know; we worship what we know, for salvation is from the Jews. But the hour is coming, and is now here, when the true worshipers will worship the Father in spirit and truth, for the Father seeks such as these to worship him. God is spirit, and those who worship him must worship in spirit and truth." Thus according to Jesus neither Mount Gerizim where the Samaritans worship nor Jerusalem where Jews had their temple were somehow more holy anymore than any other place. Having said all of that, my experience does not coincide with my theology. When in Israel I discovered two places in which I “felt” that God was somehow more present: the Church of the Holy Sepulcher and the Western Wall (also called the Kotel). My Celtic ancestors (alright, I have lots of ancestors from other places and other ethnic groups) call places where God seems to be more present “thin places. My theology says they don’t exist, they can’t exist. But my experience is different. I’m not entirely sure how to describe my experience. Certainly part of it was feelings. 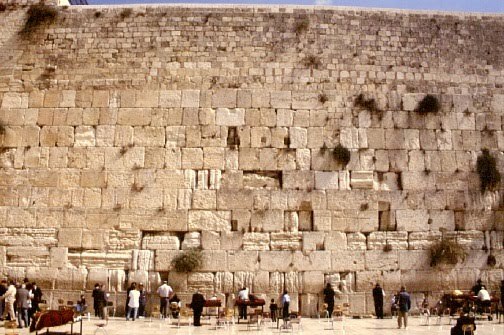 Somehow when I touched the Western Wall I had a feeling of peace and a feeling of touching eternity. And in the Church of the Holy Sepulcher I had the same sense. In that spot I felt like I was at the center of Christianity. Somehow the Triune God was present in a way that God is not present in other places. I have the same sense of presence, what I might call the eternal now when I take communion. So I wonder if I was to go to Ireland or Scotland (particularly to Iona) would I have the same sense? Or would the Dome of the Rock produce such feelings? We didn’t get a chance to go there when I was in Israel. Besides non Muslims can get kicked off the mount, curiously by Israeli police, for praying on Mount Moriah. Theology is, for the most part, thinking. It is an attempt to describe the God the Bible speaks about and what God has done, not only in the Biblical record but also since then. Is there a place for feelings alongside theology? Are there really thin places? My Calvinist head says no. My heart says yes. Someday I want to go back to the Western Wall and the Church of the Holy Sepulcher and examine my feelings theologically. Or examine my theology in relation to my feelings. As for now I have declared a truce between theology and feeling. I simply remember. How is it possible you can say that "God may also have called Muslims to have holy places as well" when Yahweh has said He alone is God and He will reign on the Temple Mount in Jerusalem? If what you said were true, He would be advocating other gods. Hmm, I was partly wrong and on the other hand you may have missed something. From a NT point of view God can now be worshiped anywhere and anyplace Christians worship God becomes holy (when two or three are gathered). As to God giving Muslims holy places you are correct. There is significant difference between the God of the Bible, particularly the NT and the god of Islam. I should have said that Muslims believe their god has made particular places holy like Mecca and curiously the temple mount. 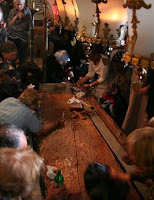 In any case the blog was about the difference between my theology of holy places and my experience of a couple of them.